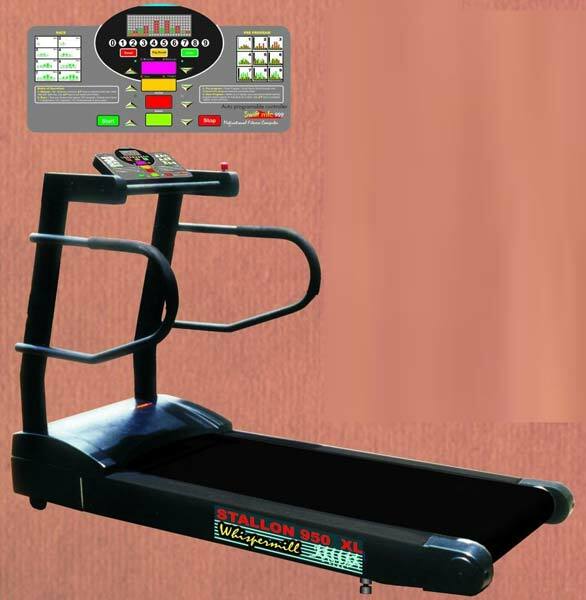 We are bracketed among the distinguished Manufacturers, Suppliers and Exporters of Stallion 950 XL Motorized Treadmill. It is manufactured using high grade steel and advanced technology. The Motorized Treadmills we make available come with powerful electronic ac inverter drive system and sophisticated speed – monitoring devices. Buyers can obtain it at affordable rates. Once you try our new STALLION WHISPERMILL you 'll agree that it's the best you can buy whatever be the purpose. Our STALLION WHISPERMILL are great machines for Aerobic, Cardiovascular fitness workout for any level of use. Our STALLION WHISPERMILL has all the innovative technology. Highly efficient, incredibly reliable brushless 3HP AC MOTOR, Continues Duty. Powerful electronic AC inverter drive system and Sophisticated speed - monitoring devices. Rugged, balanced, big steel rollers turns more smoothly and slowly at all speeds, reducing bearing wear & belt stress. We have proven performance record for last many years for meeting heavy institutional demands. 9 Pre Prog., 8 Fitness Prog. © Copyright 2012. Perfect Fitness Technology Pvt. Ltd.